"I was battling heat exhaustion in Hope, Arizona. The air temperature outside had gotten into the 110s." 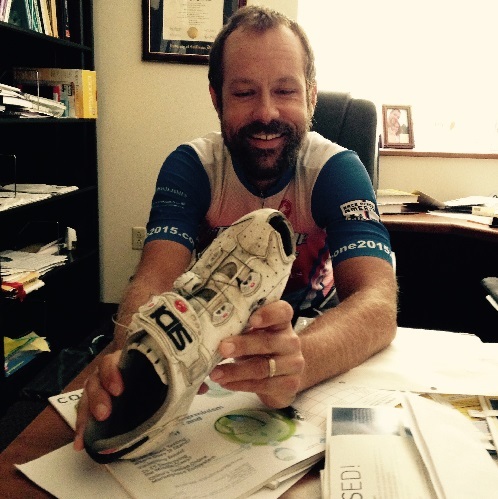 Dr. Brian Toone talks about how he first became interested in cycling. Toone talks about first learning about the Race Across America. He also details various facts about the race, such as the length of the race, how long the race has been held, and the different types of competitors. Toone talks about his motivation for joining the Race Across America. He also talks about how his accident in 2014 added to that motivation. Toone describes how he trained for the Race Across America, and what his average week of training was like. Toone talks about driving out to California and beginning the Race. Toone talks about the various challenges he faced during the Race Across America. Toone discusses if, and when, he will compete in the Race Across America again, and what he will do differently. Toone talks about what motivated him to overcome the challenges of the Race Across America. MICHELLE LITTLE: This is Michelle Little, and I'm here with Brian Toone. This is July 31, 2015 and Brian, if you'll just go ahead and tell us where you grew up and how you fell in love with cycling. BRIAN TOONE: Ok, sure yeah. I grew up here in Birmingham and went through the whole Hoover school system all the way through high school and, actually, so biking my dad used to do it for exercise after work at Oak Mountain. And, I do not know, I was maybe nine, ten, something like that and I would join him and we would ride the park road. It was, I mean this was before even the mountain bike trail, so this would have been the mid-1980s. So we would ride the park road out to the lake and back, and, you know, then I kind of got into other sports past that, until high school when some buddies of mine said "Hey, do you want to try out mountain biking?" And so we went down to Oak Mountain, I had borrowed one of their bikes and we went down to Oak Mountain. And this was kind of the early days of the trails that are out there and we had a blast. I was hooked then. Actually, a couple of days later, or maybe it was a week, who knows. It was so long ago now. But, he got a flyer, one of my friends got a flyer for a race up in Sewanee, a mountain bike race up at the University of the South. And I got so excited about that, and that was pretty much it, I raced all through college. This was junior, senior year of high school, so I raced all through college and it just kind of sprung board from there. MICHELLE LITTLE: Ok. Alright, when did you just hear about the Race Across America and what made you decide that you wanted to do that? BRIAN TOONE: Well, actually, right in that time when I was getting into cycling, you know, my parents were, I cannot remember what it was for, either birthday, Christmas or something, they were going to give me a book on cycling. And the book they got me was actually about RAAM, and it detailed the race and the different, you know, aspects of the race, so way back in high school even was when I first heard about it. MICHELLE LITTLE: So how old is the race? BRIAN TOONE: The race started, that was actually fairly recent. The race is, I think thirty-eight years old now, so when that, that must have been around the ten year anniversary, so ten years old, because I think it started in 1982. Somewhere in the early 1980s, and so I would have been a junior in high school in 1993, so maybe around ten years old at that point. MICHELLE LITTLE e: Tell us how many miles is it. BRIAN TOONE: So it is a 3000 mile race, and they have used different courses throughout the years, but always trying to make it that 3000 mile figure. I think one of the early editions started in San Francisco and finished in New York, and whatever route they used then was 3000 miles, and they have done variations of that over the years, always west to east, always California to the east coast. And the course that I did, the latest course that they have been using now for six or seven years, and they are real happy with the logistics on either end, so they will probably keep using it for a while. But that 3000 miles. So this years is 3005 miles, so they try to keep it real close to that, you know, for records and things like that. MICHELLE LITTLE: And how many people usually participate in it? BRIAN TOONE: It has grown, somewhat. There is more and more people doing the ultra-cycling, but still, in terms of bike racing, it is still a small race. This year, I think there were forty-one people who tried to do, you know, the solo, you know, by themselves race across the country. And out of that, I believe, there was seventeen people finished in my category, which was the biggest category, but including the other categories there was twenty-three, I believe, people who finished out of the forty-one. So the stat that they quote on the website is that more people have climbed Mt. Everest than have finished the Race Across America, because there are so many problems that can come up during the race. So even this year, it is barely a 50%, you know, finish rate. MICHELLE LITTLE: Tell me about some of the different types of people, because its draws people from all other the world. BRIAN TOONE: Yes. MICHELLE LITTLE: What are some of the cyclists like and where are they from? BRIAN TOONE: A lot of the ultra-cycling, ultra-cyclists come from Europe. There is a lot of, from central Europe even. A lot of those countries; Austria, Slovenia, trying to think, Germany, there are some from Britain as well. But a lot come from Europe. It is more popular over there. They will have these twenty-four hour races, and races around the various countries there. Maybe because those countries are small, or maybe, you know, more people can do it, and so it just kind builds on itself and more people get into it, but because America is so big, you know, a lot of them want to come over and do this race because it is so long. MICHELLE LITTLE: What were the, you had to qualify to do the solo race, what was the qualification like? BRIAN TOONE: So, the qualifying for the race is there is designated races throughout the world, so some in Europe, some here, and you basically have either a distance you have to achieve over a set amount of time or, if it is a fixed distance, then you have to finish it in under a certain amount of time. So, for example, the race I did was laps of, I think, twenty, twenty-five mile course and you just did as many laps as you could within twenty-four hours and you had to do 400 miles in order to qualify. And I ended up doing 444, so I was fine for qualifying through that. MICHELLE LITTLE: When did you decide to sign up for this, the 2015 race? When did you set your sights on that? BRIAN TOONE: So, back in 2013, I had started to think more about long distance riding really starting with an event a friend of mine put on riding the entire Natchez trace, so from Nashville down to, Nashville, Tennessee down to Natchez, Mississippi. And he invited me to this in the middle of the racing seasons, I was really trying to decide, you know, whether I wanted to do it. But it is a good cause, and I got to thinking, well you know maybe I can use this a s a test for Race Across America, because, even a couple of years before that, the idea had come back that maybe I could do some of these longer races again. And, well not again really, but get into the longer races. And so, during that event, we road from Nashville down to Natchez, which is also 444 miles, which was a nice coincidence for my qualifier. In fact, I did stop with about two minutes to spare so that I did not tip over to 445, because I thought, “Oh, that is perfect, I am just going to stop right now.” But anyway, so after that event was over, all those guys were from Nashville, so they were driving back to Nashville, and me being from Birmingham, I had had Christine, my wife, drop me off in Nashville and then I would ride home to Birmingham from Natchez. So, and that was the real test. You know, could I do this kind of unsupported additional 400 plus miles after doing the original 444 miles, and that went well. And so, that is kind of what firmed up to do the race, but I was not sure when, so, getting to your question, my thinking was sometime in the future, you know, in the next few years. And in 2014, so April of last year, I had a bad accident where I ran into a car and was unconscious and it was just really bad. When I woke up in the hospital, my first thought was whether or not I would be able to ride my bike again, and, and then within, you know a short time after that I started thinking, well, you know, I am going to try to do Race Across America, because there is no guarantee that, you know, two years, three years, four years, five years from now I will be able to ride my bike, and so that kind of, I was like, “I am going to do that as soon as possible”. Of course, I am in the hospital, so it definitely was not going to happen in 2014, but, fortunately, I had a very quick recovery and everything back to normal, in, really, just a couple of months so that I could train, prepare for 2015. So that is how it all came together to happen this past year, or this year. MICHELLE LITTLE: So do you think it sped up your recovery too, to have this goal in sight that you wanted to do? BRIAN TOONE: It did, but even before that, I mean there is, I was supposed to race twenty-four hour mountain bike nationals in the summer of 2014. And, you know, I was already registered for the race and everything, so I kind of set that as a goal, and I actually did end up riding that race and getting seventh, which I was really happy with that, which also was the same place I got in Race Across America, which was another of those fun little coincidences. But that really, that really set my training and, you know, I had broken my jaw pretty bad, so I was doing these five and six hour rides, you know, unable to open my mouth. So I having to do that all breathing through my nose. It really, I think it really did help. Just kind of my body was trying to repair itself, you know, as fast as possible. So, yeah, that really, I think it helped MICHELLE LITTLE: What was your, just give us an overview of your training schedule once you knew your race date. And what was your week like? BRIAN TOONE: Well really, coming out of that summer race, so after racing mountain bike nationals, and coming into the fall, I started to do longer rides, you know always centered around commutes here, to Samford. Or races as well. So even by the end of the year, so on the weekends when I would do races, instead of driving to the race I would ride to the race, do the race and then ride home. A good example of this was a race up in Cullman in October of last year. You know, I rode up to the race, did the race, and rode home. That ended up being 250, 260 miles of riding, racing. I would do that on the weekends, did that a few times. One or two times in the fall of 2014, but then all my racing in the spring I did that. And, so that just was on my weekends, I was getting these really long rides in from riding to the race, doing the race, and riding home here in Alabama. During the week, and that was on top of during the week, I had my spring schedule ended up working out to be Monday, Wednesday Friday classes, so if I did not have any meeting Tuesday and Thursday, I could move all my work to the other days, and just leave middle of the night, or early morning on Tuesday, you know, or Thursday and ride all day. And then I would be able to put on these 200 mile, 300 mile rides in the middle of the week. So I think it worked out too. You build your training up, you are letting you are body adapt to the training you are putting into it, so going from 400 mile weeks to 500, 600, 700. My longest ended up being just under 1000 miles towards right before the race started. MICHELLE LITTLE: You did a thousand miles? BRIAN TOONE: Right, a thousand mile week. My longest individual ride would have been in 2014 and 2015. Birmingham has a 500 mile race, and it is done as one ride. That is my longest individual ride. MICHELLE LITTLE: What race is that? BRIAN TOONE: That is called the Heart of the South, and it is actually and older race. They have been doing now for ten, twelve years consistently, and it starts down in the colonnade and it rides all the way up to Fort Mountain, Georgia, near the north Georgia, east of Dalton, east of Cartersville, I cannot think of it, but turn around in Ellijay, Georgia and back to Birmingham. 500 mile loop. MICHELLE LITTLE: What kind of calories would you have to consume on a daily basis to do this. BRIAN TOONE: You consume a lot. A lot of it is good breakfast in the morning, and a lot of it is on the bike. So, you know, while I am riding. So even like today, coming into work, I am going to ride after this too, I have got Cliff bars, and, you know, these little waffles that you can get, my back pack is loaded with that. So, you know, you can consume, you might be burning 3000, 4000, 5000 calories on a ride, but even with that you are consuming 15,000-20,000 calories on the ride itself. Then you are hungry after the ride, so you eat a lot, and you are hungry later too, so you are trying to get this balance between the calories. It is a hard balance to strike. You can get on either side of it if it is not really good. Like, even during the race I was actually putting on weight, because I was not, I was taking in more calories that I was actually burning. MICHELLE LITTLE: Tell us about the beginning of the race and getting out to California BRIAN TOONE: So, the way the race is set up is that you have a crew who follows behind you. Follow vehicles is what they call it. We had a friend of ours had rented a van for us and given it to us so we could use that for the race, so we needed to drive it out to California. Three of my crew, were from here in Birmingham, and myself, we drove from here in Alabama all the way out to California. Which was really fun, because I have all kinds of connections along the route and history through, basically the whole country through there, and we would stop at all these places that I have ridden before and lived before. We would go on these rides like, “oh my gosh, this place, we've got to go ride here, and we've got to go do this climb.” There were some new stuff, too, that friends of mine had told me about, and I never had a chance to ride, so we did some of those rides on the way out. So we had a fun time on the way out there. Then we met the rest of our crew out there in California, just really a couple of days before the start and then, you know, the race started and it was very very hot. (laughs). So it was interesting though, because Oceanside, which is the start, Oceanside, California. Many people might have heard that the Pacific Ocean is very cold, it is a cold ocean. It does not have the warm gulf stream going through it. It is a very cold ocean. On the coast itself, that keeps the coastal climate very cold, but as soon as you go inland, even just a few miles, not even ten miles, five miles from the coast the temperature can be twenty degrees hotter than the fog covered, cloud covered coastal area. And that is exactly how the race started out. You started in the sixties and it was in the eighties, nineties and 100s within a couple of hours of leaving the coast. And I really struggled with the heat that first day and the first night and the next day. Ultimately, having to stop and cool off for a while. MICHELLE LITTLE: So what was the most difficult part of the race? BRIAN TOONE: Physically, it was most definitely the heat. The heat was definitely, I mean, it slowed me down the most, because I had to stop so many times early on to hop in the car on the side of the road with the air conditioning on full blast, and that was on top of the longer stop that we had when I was battling heat exhaustion in Hope, Arizona. The air temperature outside had gotten in to the 110s, so even the air conditioning in the car was not even cool enough. So we went to inside a gas station and I laid on a cot in the corner of the gas station for about 3 1/2 hours trying to get my body temperature down. That was definitely the hardest, especially on the west coast. They were having a heat wave. It was not just normal desert heat, they were setting records following us on the course. Especially, that was mentally frustrating too, because when we made it up to Flagstaff even, which is at an altitude, the average high will be in the seventies in June, it was ninety-five degrees in June when we went through Flagstaff. I do not know if they set a record, I think it was one of the towns that set a record along the route, so you did not really have any relief until Colorado. And then what happened is that you got over the mountains in Colorado and it would be hot in the plains of Colorado. It would be hot in Kansas, but for a shorter amount of time, instead of being hot all the way through the night and the next morning. And the farther east we go, there was actually a tropical storm that had come through, I think it had come through Texas or something, I was so focused on the race I remember hearing something about it, but it did leave moister air, and it rained on us a couple of times and I think it just cooled temperatures down. It really cooled the whole east coast off for, you know, the rest of the race. But the heat was a big struggle for at least the first have. For the second half, you started to get more pains in your hands and feet. Those were the two big pains. You just get to the point where you cannot ride anymore. You have to get off your bike and sit down and rest, you know, because your feet hurt so much, or your hands. At some point I could not hold on to the handle bars, I was ridding using my forearms to kind of navigate and steer the bike, I could not grip the handle bars any more. and later in the race, even beyond that or kind of mixed in with all that you started to get sleep problems where no matter how much you slept or if you slept too much, which was the other problem. We decided to reward me with a three hour sleep one night and I just could not get going the next day, because my body, I think, kind of shut down and I just could not wake up. It did not matter how much coffee. We were joking that I would drink this coffee concentrate, you know, straight up without any water, it did not matter. So I would have to stop again and instead of trying to cool off, this time it would be just sleep in the car for fifteen minutes to just get going. Then ride for an hour, stop then sleep for another fifteen minutes, and eventually you would accumulate enough sleep that you could go for another twelve hours of riding. Fortunately, eventually you ran out of room. You made it to the end eventually. So, that was kind of, those were the physical problems really. Heat initially, pain, hands and feet in the middle, and then sleep kind of in the middle to the end. MICHELLE LITTLE: Three hours of sleep was the reward, so what was your normal? BRIAN TOONE: Normal sleep was and hour and a half, and doing the race again, I will never try to do more than an hour and a half, because I think your body goes into a deeper sleep after that. At least my body does, I could not wake up. Whereas I would do these hour and a half sleeps, and I do not think they were that deep of a sleep, but, you know, your body has just enough to start moving again, and then the process of riding, scenery, and everything that you are doing kind of wakes you up. And that did not help after three hour sleep, because you just could not keep your eyes open. MICHELLE LITTLE: Did you ever fall asleep on your bike? BRIAN TOONE: I did, I feel asleep three or four times. And that is a real danger. It is very common for racers to do that, and this year one of the guys I ended up passing towards the end was way ahead of me, but fell asleep and landed hard on his shoulder and broke his collar bone, but he was close enough to the end that he was going to finish anyway. And he did, he road 200 miles with a pretty badly broken collar bone. Of course, it slowed him way down and I was able to catch him in the end. But when I fell asleep, fortunately it was all on up hills, every time was on an uphill. I would have these dreams when I was in a mountain bike race and imagining going up this trail. It was not like single track really, the more I think about it, it was more like a dirt double track, and some friends of mine would be manning this table. And I could remember the table would be set up on the side of the road and they would be standing there, because a lot of the mountain bike races which I have done have had these check points where you have to check that you have not cheated by cutting the course, and so this was kind of the dream I was having while I was riding. I would stop riding, get off the bike, and that would wake me up. And then I would be confused, like “why am I standing here, you know, in the road beside my bike?” And my crew would be like, "Get back on the bike!" It did not actually happen in the 500 mile race, which is also really challenging. The one here in Birmingham was really challenging because you start here at night, so it is really hard with sleep because you ride through the first night, and also ride through the day, and then the next night. That race, the sleep is even a bigger issue and I would actually, instead of having any kind of dream or anything, I would start to fall over and that would wake me up in that race. But that really did not happen in RAAM because, I think, partly because I was always on the bike, you know, going uphill, and the dream had me stopping anyway. So I think that kind of was, you know, subconsciously getting me ready to get off the bike right at that point were I was stopping, so I was very fortunate. MICHELLE LITTLE: You are sleep riding instead of sleep walking. BRIAN TOONE: Right, yeah basically there was part of my body that was still able to peddle because I was going uphill. Maybe it started in West Virginia, but in West Virginia, Maryland was when that happened. MICHELLE LITTLE: What were your favorite parts about the race? BRIAN TOONE: The course was really great, they picked a good course. You really do see a lot of things. Obviously your going across the whole country, but you are really going across rural parts of the country. They avoid, you know, the logistics of forty racers with follow cars and RVs to sleep in. and on top of that, all of the teams that are racing, which start later behind us and eventually catch us on the east coast. But anyway, so you have a lot of people going cross country, so if you are going through big cities, you have a lot of traffic and more problems, so they route you way around the bigger cities. You see a lot of rural America. I think that was my favorite part for sure was all the different places that I got to see. Every state has its own, you know, highlights and everything. as far as scenery, there was this one place in Colorado that probably had the best view, because we had gone over this really high pass and you are going down the other side and just spread out bellow you was this huge valley, there were no trees blocking the view either. You are really high up, and you could see this huge valley and across the valley were these snow covered peaks. Not like in the distance, like right there you could actually see the sloop going straight up to the peaks and eventually snow covered. and it was such a long decent that you are sitting there staring at that for probably about ten minute, which on a bike when you are going forty, forty five miles an hour, fifty miles an hour even, eight, nine mile decent down to the valley. And that whole next stretch even once we were down in the valley, you really did not have as much as a scenic view because you are down almost in a little canyon and you have these cliffs, and everything was green. I think they had had some rain. It was really pretty. Scenic wise that was that stretch in Colorado that was just awesome. Some of the stretches in Arizona, which should have been really beautiful, we hit in the middle of the night. It was just bad timing. Like Monument Valley, which my wife had been really looking forward to it, and it was dark, could not see anything. Then the farther east you went, I really liked Kansas as well. It was so different from what I am used to riding in. It was really neat, to just go through this rural part of the country I have never been in. Indiana was my favorite state, and some of that was some really cool scenery, but some of it was the race coming together and everything flowing through Indiana. Maryland was probably close second, some amazing scenery. So the short answer is I really enjoyed the route and seeing everything, of course that a big part of the ride is going to new places and discovering all these cool things, that are much easier to get to and see on a bike. MICHELLE LITTLE: Did you get to ride with some of the participants or were you all very spread out? BRIAN TOONE: We were pretty spread out. At the very beginning they start us at one minute intervals. so you are very close together. Usually based on ride speeds, you pass. I was one of the faster riders, so I passed a lot of people at the beginning, but when I started having problems with the heat and everything, a lot of the people that I had passed started to catch back up to me, including one person, Eric Newsholme, from Georgia. We were the only two people from the south, I think. There may have been somebody from Florida. I think we were the only two people from the south. Anyway, he caught back up to me, and the rules allowed you to ride side by side for up to fifteen minutes a day, so not very long, but we did. We may have gone over that a little bit, but when I was coming out of that gas station, he just happened to be rolling in right as I was sleeping, and he had already stopped a while ago. So he was ready to go. So we just rode together, and that was really encouraging, really motivating. There was another racer in Colorado that I rode with for a little bit. We climbed the one out of Cortez, Colorado, western Colorado. There is a big climb out of there. And we did part of that climb together, and he was having problems sleeping. Like he was having sleep problems there, and even that early in the race, I too was having problems. You are sleepy all the time, but you can get to various points where you can deal with it or you can also be in that point where you are drowsy and just not fully there. It is interesting that that moment in time, he was dealing with that, whereas I was not. Whereas just down the road, maybe, I will start having that problems, so it will turn really quick. So I road with him and then I road with one of the guys towards the end of the race. Where we passed each other a number of times, and we road together one time. I cannot remember who was passing, I think I was catching him, and when I caught him, we road together for a few minutes and then I went ahead and passed him, but he passed me again later. We went back and forth a number of times near the end. But it was really just those three people, nobody else. I passed a number of people, and got passed too, but a lot of times, based on how you are feeling at the moment, one rider is going to easily be going two, three, four, five miles an hour slower than the other riders. And if you are the faster rider, you want to take advantage at that moment in time you are feeling good, because later it is going to be you who is riding slow. You know, so it is odd that you get people who are ready to ride at about the same speed. It is a race, and it’s definitely competitive, these are your competitors, but at the same time you are always saying hi to people as you are passing them, and vice versa. It is really survival really. You are all just trying to make it to the race. Everybody is trying to make it as fast as they can, but there is also the element that is the competitive aspect. But there is also the aspect of just finishing, and everybody deals with that. Even the top racers. The racer who has won the past three years, two years had to drop out this year for medical problems later in the race. And he was second or third at the time. So, there is no guarantee that you will finish. And that adds comradery between all the different racers. MICHELLE LITTLE: What is the reasoning behind the rule that you can only ride side by side for fifteen minutes? BRIAN TOONE: There would be a huge advantage if you decided ahead of time. Like Eric and I, you know, we are friends, we know each other, we have met each other, and raced a couple of times now on these long races and those bond you very quickly. So we communicate, even driving out, he was one day ahead of me driving out, so we were communicating back and forth, he was like, "Watch out for cops in west Texas, and you may be able to take a detour here, construction is really bad." So I had the advantage of getting those updates from him, which was really nice. We could have decided ahead of time, "Hey, let’s ride side by side the whole race." It is a huge advantage mentally, you know, to have someone there that you can talk to. And so if you are somebody else who does not have a friend like that, then they would be at a disadvantage. And so I think it is a compromise they came up with to allow you to ride with someone without getting a significant enough of an advantage. I think that is the reason. I could be wrong, but that is my guess. MICHELLE LITTLE: Do you think you will do this again? BRIAN TOONE: Yes MICHELLE LITTLE: When do you think you'll do it again and what are you planning to do differently this time? BRIAN TOONE: The timing of when I am going to do it again is really up in the air. My original thought was to wait until I turn fifty, because that puts you in the next age category, so that will be twelve years from now. They put you in the next age category which maybe, if I continue to ride, I will have a shot at not only winning but also breaking some long standing records, which will be a nice goal. Just the logistics of it is, we were not thinking we'll do sooner than that. The more I start to analyze the race and think about how many different things that we could have done differently and saved a lot of time, the more I am thinking I want to do it sooner so I can take advantage of all that, and have a much better shot of doing better. I finished seventh this year, but my goal really was to win, and if I could not win at least get in the top five. I did not do that either. I did not meet my time goal either. So with all those things, I really feel like I can do all those things with what we learned. The big three things are definitely the heat. A lot of the other racers wore full, covered in white clothing with white heat sleeves over their legs, and then their arms to get the sun, because out west there is just no shade at all. I was not prepared for that. So I did not have any of that stuff. So we would definitely have that practiced, some heat related riding. I was at a little of a disadvantage this year. We had a bit of a mild spring here in Alabama. I kept on waiting for it to get hot, and it did eventually. I did a few hot rides, but nothing like the past, where it would be hot for a week or two in April and May. I think we barely hit nineties at all before the race started back here. Even if it means I have to travel someplace where it is warmer, I might do that just to get ready for the heat right before the race. That is a good thing. Shoes. We have a couple different strategies that I will try with my shoes. Wear much larger sized shoes. We had to cut holes in my shoes because of the swelling in my feet. So I am going to start out with the normal sized shoes and then have a much larger sized shoe that is gel padded. Some sort of cushioning in the shoe to help the problems that I had with my feet, because there was time that I had to coast. I would be awake, not tired, in my legs or arms or anything, I would be ok, I could ride. But the pain in my feet was such that I could not push down on the peddles. So I was getting really frustrated in the middle of the country. I had down all this training and I could not tap into to the fitness that I had because my feet hurt so much. So we will deal with the heat issue, and also my hands. I had decided to try and do it, do the whole race, without using the fancy aero equipment that a lot of the riders have, and part of it was these little aero bars that you can put on your handle bars, and I decided not to do that just because it is not really my background. I do not like to use those when I am riding, training, and of course it is not allowed in regular racing. So I did not want to do that, but it is allowed in Race Across America and ultra-distance racing. The reason why it is allowed is because it is a huge benefit to be able to get your hands so that you can hold on with your forearms and then your hands grip lightly on the bars. And so, I will start out with that next time. That will be helpful for my hands. MICHELLE LITTLE: So those are the bars that go straight out, like on triathlons? BRIAN TOONE: Yes. And that is the background of a lot of the racers here. A lot of the racers are coming from a triathlon background, not from a mountain bike, road racing background. Some of them are. I am definitely not unique in that aspect, but I am definitely in the minority. A lot of the competitors are either coming from the triathlon background or have been doing, especially the Europeans might be coming from. The Americans, a lot of them are coming from triathlons, Ironman and things like that. The Europeans may be coming from, they might live in one of those countries where, even from a young age they just start into ultra-cycling. They have been doing it for a long time. Which is why no American has now won this for thirteen years. Next year it will be fourteen years since the last time an American has won this. MICHELLE LITTLE: To sum up, what was your motivation like, at the end of one of these long days and you are falling asleep, what was in your head that was getting you through it? BRIAN TOONE: By the end of it really was becoming more of the race. I was catching people in front of me. People behind me were catching up to me. There was… the top ten was really undecided late in the race, and that just gave me a lot of motivation. So, that helped me. Even having that motivation really did not help with the sleep problems, but I did not really notice my feet anymore, or whatever started to hurt. I would kind of wiggle my feet around, trying to get a different position, rather than coasting or anything else, I would just push through it. Same thing with my hands. Although, I think by that point my hands were just numb. I do not think that there was really any pain anymore in my hands. And we also had those bars, so I was using those bars a lot by the end. That was the other thing with my hands. But my feet, they hurt the entire time. From eastern California to the end of the race, my feet hurt. But again, coming together with other racers catching me, and me catching other racers and all of us real close together, or several of us real close together by the end, that helped me deal with the pain. That was motivating. But also earlier in the race, when you are so far away from anyone, and there is all kinds of reasons to stop riding. My family, we had watched, before I left for California, we had watched this movie called Megamind, and there was a couple of songs that I had stuck in my head from that soundtrack of that movie, but also there was a scene where, you know, the protagonist is falling to his doom and all of the sudden he turns the situation around and is like, “I normally chalk this up to another epic failure” or something like that, and then he is like “but not today.” And there was several times that I just imagined that scene or be thinking about that scene when I was thinking about stopping riding or just losing motivation and slowing down because of it, I would pick up the pace again. I would think of that scene and pick up the pace again. It would not last very long, but it happened a number of times. And of course my family was there at the end waiting. My wife had gone with us on the crew, but my kids were going to be there at the end. And all the support that I had throughout the race through people sending Facebook messages and tweets that my wife would read to me while I was riding, that was super motivating as well. I cannot quit and let all these people down. The only time I thought about quitting though was at the beginning when I was having heat problems, some real heat problems. The road to, to give you an idea about the problems, my eyes were not lining up correctly. I do not know if that is a normal symptom of heat exhaustion, but I could not see straight. My eyes were not lining up, and so the lines in the road did not look straight. It was all very disconcerting. Maybe I was just getting dizzy or something. But that was happening and on top of just feeling like you were in an oven and do I need to stop riding, and I was just lying there thinking that my race was over. Not wanting to quit, but that my crew would not let me continue, or that I would not be able to continue. That was the only time that I thought, "Oh my goodness, I am only 300 miles into this race and it is about to be over." And so when I got back on the bike after that, that was when Erik came by and we road together. The timing of that was just perfect. The fact that I was able to ride and keep up with him for how many minute that we was together, that just turned everything around. I was like, "oh, the race is not over yet", you know, and was able to keep going. After that, when my motivation got low, it was never, "I am going to drop out," it was more like, "I am going to stop trying." You know what I mean, like I am going to just finish. But whenever those things happened, that scene from Megamind or Christine would read me some stuff and, you know, I would start riding hard again. And of course it took care of itself once there was other people nearby. Because when you are a hundred miles from the nearest competitor, what motivation do you have to go fast? When, you know, there is somebody who is ten miles behind you closing the gap, all the sudden there is motivation to go, or when there is someone who is thirty miles ahead of you, and next time you check they are only fifteen miles ahead of you, that can be for somebody like me who has a long racing background, it felt like a race. And that was a big motivator for me at the end. MICHELLE LITTLE: Wow, that is amazing. Thank you for sharing all that.